In ‘Pigs is Pigs’ a fat little pig thinks of food all the time. At night the pig dreams he’s being fed by a machine of an evil scientist with a hic-cough. He eats so much, he explodes. He awakes in a fright, but when his mother invites him to breakfast, it’s clear he hasn’t learned anything. With its quasi-moralistic tale, its family-setting, its child star, and its Silly Symphony-like backgrounds, ‘Pigs is Pigs’ is still firmly rooted in the goody-goody world of the mid-1930s. However, an early ‘Hold the onions’-gag (the first of a long series), the fast machine-scenes, and the surprisingly non-moralistic finale look forward to a more individual Warner Bros. style. ‘Pigs is Pigs’ is far from a classic, but it’s surprisingly well animated, and shows that by 1937 the Schlesinger studio could use the Disney influence for their own ends. In the early 1950s Lantz seemed to be in search of new characters for his cartoons. 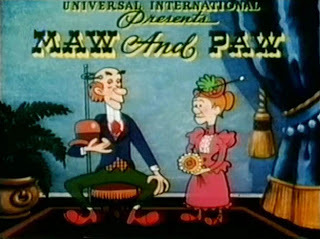 This cartoon introduces Maw and Paw, two poor, phlegmatic farmers with hundreds of kids and one pig, who’s introduced as being the most intelligent of the lot. In an almost plotless story the pig wins a sports car. This leads to a lot of gags, without getting any funny. The cartoon even seem to look back all the way to the early 1930s with its barnyard setting and its abundance of repetitive animation. Maw and Paw were no strong characters, and their series stopped two years later after only four films.